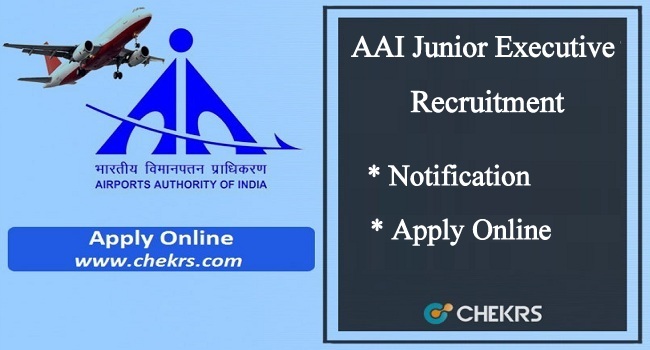 AAI Junior Executive Recruitment 2019: Airports Authority of India (AAI) invites the applications from eligible candidates possessing valid GATE-2019 Marks through AAI Junior Executive Recruitment 2019 Process. The interested and eligible candidates can fill the application form in the online mode form before the last date. The AAI is going to fill up the vacant posts for Civil, Electrical Engineering, Electronics & Architecture but the number of vacancies are tentative and may increase or decrease at the sole discretion of AAI. You can check the AAI Recruitment Through GATE 2019 complete details from here. The Airports Authority of India has released Junior Executive Recruitment 2019 Notification on the official website to fill up the vacant posts. The AAI has released the Airport Authority of Indian Recruitment 2019 Notification for the junior Executive Officer Posts in the Civil, Electrical and, Electronics streams. The candidates who have qualified or have scored the good marks in the GATE-2019 will be eligible for the AAI Junior Executive Officer Recruitment process. This is a good job opportunity for those candidates who want Government Jobs in AAI Filed. Here we have shared the Eligibility, Selection Process, Age Limit, Pay Scale and more details. Candidates are advised to read the instructions carefully before applying online. The Instruction has been available in the Notification Pdf. Applicants are informed they must complete their AAI Jr. Executive Officer Online Application 2019 on or before the last date. After the passed the last date, the exam authority will not accept their application form. Candidates should have a valid personal e-mail ID. It should be kept active during the currency of this recruitment process. Application Fee is to be paid by the candidates through ONLINE MODE ONLY. Fee submitted by any other mode will not be accepted. The SC/ST/PWD/Female candidates are exempted from payment o the fee. Before applying these posts, candidates must check eligibility for the Junior Executive Officer posts. In this article, we are sharing AAI Recruitment 2019 Details which are given below. The age relaxation for the Reserved Candidates is applicable as prescribed by Govt. of India orders issued from time-to-time. Applicants need to visit the AAI official Website. Download the Pdf and Read all details. After then click on Apply Online link. Fill the details in a correct manner. Pay the application fee and upload the scanned photograph and Signature. Submit the application form and can take a print out for the future uses. Before applying for the post, the candidate should ensure that he/she fulfills the eligibility and other norms. Furnishing of wrong/false information will be a disqualification and AAI will not be responsible for any consequence of furnishing of such wrong/false information. Screening and eligibility will be based on the details provided by the candidate. Candidates shortlisted on the basis of GATE Marks will be called directly for document verification which will be held at Corporate Headquarters at New Delhi. We are providing latest update for AAI Junior Executive Recruitment 2019, keep visiting our website that is www.jobs.chekrs.com. In the case, you have any query you can drop a comment in the comment box.